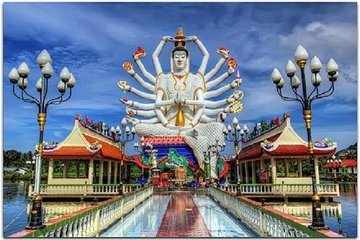 Capturez le cliché de toute une vie lors d'une excursion photo à Koh Samui, et voyagez jusqu'aux sites les plus beaux et emblématiques de l'île : saisissez la lumière de l'après-midi sur la scintillante pagode dorée, la paire évocatrice des rochers de Hin Ta et Hin Yai, et les décorations richement ornementées de Wat Plai Laem. Trouvez le meilleur point de vue pour observer « l'heure dorée » de Koh Samui se fondre dans un éclatant coucher du soleil tropical, tandis que la lumière s'éteint dans le paisible golfe de Thaïlande. This is not a photography tour. It's a sightseeing tour. The guide knows a little about the sights, but says very little. He knows nothing about photography. The vehicles were very comfortable and we could stay as long as we wanted. Unfortunately there wasn't much to stay for. tour was ok but couldve been a whole lot better...for a start the guide was not really aimed at photographers but it was more of a sight seeing tour which i had already done, the other person on the tour could speak thai so alot of the time the conversation was between the two of them, alot of the spots which wouldve been great photo opportunities were bypassed as they were either dirty or inappropriate which is usually what makes a great photo. the sunset at sunset beach was great and i really enjoyed that. Definitely was the highlight of our trip. Our driver picked us up at our resort and took the worry of getting around site to site. He provide a history of the island and an excellent narrative and explanation of the significant sites we photographed. The final destination allowed some excellent photographs to be taken with the sun setting. I would recommend this tour operator for this and any other tour they provide. Professional and knowledgeable.